With the shift from OS X 10.8 Mountain Lion to OS X 10.9, Apple opted to switch from naming its desktop operating system updates after big cats to naming them after distinct California landmarks or "places that inspire us," as Craig Federighi explained during the 2013 Worldwide Developers Conference. Mavericks, a popular surf spot, was the company's first choice, and as we approach the initial preview of OS X 10.10, there's a lot of speculation about which landmark Apple will choose next. Back in April, several possible naming choices were discovered in the form of trademarks that Apple applied for on California-related terms including Yosemite, Redwood, and Mammoth. MacRumors has now discovered an additional set of names that appear to be linked to Apple, which trademarks were filed for on March 11, 2014 in Trinidad and Tobago, a favorite early filing spot for the company. The terms, all of which could be slated for future OS X releases, include OS X Sequoia, OS X Mojave, OS X Sonoma, and OS X Ventura, as well as the individual names Sequoia, Mojave, Sonoma, and Ventura. While Sonoma and Ventura are major California cities known for vineyards and beaches, respectively, Mojave refers to the state's Mojave Desert while Sequoia likely refers to the Sequoia National Park famous for its giant sequoia trees. All of the names represent well-known California landmarks and are suitable for Apple's new OS X naming scheme. At this point, the full list of known trademarks Apple has registered for includes Yosemite, Redwood, Mammoth, California, Big Sur, Pacific, Diablo, Miramar, Rincon, El Cap, Redtail, Condor, Grizzly, Farallon, Tiburon, Monterey, Skyline, Shasta, Sierra, Mojave, Sequoia, Ventura, and Sonoma. It is unknown which name Apple is leaning towards for OS X 10.10, but an iOS 8 banner currently hanging at the Moscone Center ahead of WWDC featured an underwater theme, which may hint at the company's OS X plans. Along with the trademarks for several OS X terms it filed for on March 11, Apple also appears to have applied for trademarks on the terms "Apple Watch" and "Watch," continuing its long trademarking spree of iWatch-related terms, which included several new filings under shell company Brightflash back in April. OS X 10.10's official name will be unveiled this coming Monday, during the keynote presentation of Apple's Worldwide Developers Conference. The event will take place at 10 AM Pacific Time. Here you go. Looks like Yosemite! So, in your mind was Lion too "Africa centered?" And was that a problem for such a global company? I think the world is more familiar with the lion than it is with random bits of California. I want a series of versions based on cheese. “I updated to OSX Blue Cheese ... it stinks"
"Mammoth" would be a nice choice if they want to follow up Mavericks in the tradition of making people confused about what it is named after. Still holding out for OS X Compton. We do have Dr. Dre now and all... ns;js. For a global Company, Apple is taking an attitude too US centered. Or too California centered. I don't think thats good for Apple. So it's not OS 11 ? 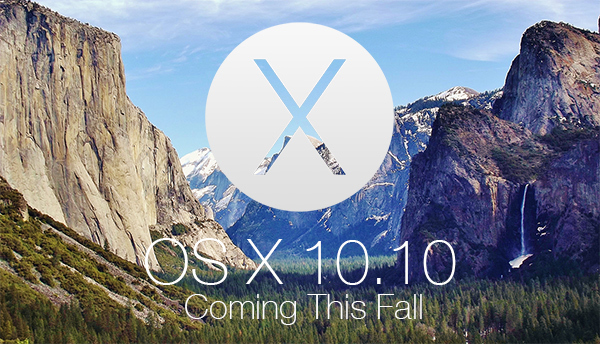 if 10.1 == 10.10 && 10.10 < 10.9 the new os name makes no sense. UNLESS the focus of this operating system will be time travel! They are not numbers. They are strings. That sounds close to Finnish word sekoa - to go haywire. The new Mac OS X 10.10 Go Bananas.